There are not enough hours in the day, as the band Gomez noted. I am a voracious reader. I am also self-employed. These two truths do not rub along too easily together. I am one of those people – not rare – who always has more than one book on the go, a couple at home, one in my bag for public transport. At the moment I have three books on the go that I wish I had more time to read. I’d like a week off work so that I could concentrate on one and finish it. Then I could add a new one to the carousel and not get enough time to read that. When you are self-employed, you become very conscious of not working. (Word recently gave me two books to read and review, which means reading and working – Nileism by Allan Brown and The Celestial Café by Stuart Murdoch – so I put my leisuretime books on hold and read those.) My other problem is that I tend to pick big, fat books, which take up a lot of space in my bag which might be more usefully employed for a packed lunch. My three books are, as pictured, Israel by Martin Gilbert (first published in 1998, but revised in 2008), The Kennedys: An American Drama by Peter Collier and David Horowitz (published in 1984), and When The Lights Went Out by Andy Beckett (published in 2009). The first, which I bought and started reading in 2009 after the three-week Gaza War and put aside when it was usurped by something a little easier, is back in circulation because of Peter Kosminsky’s The Promise on C4, which has not just reignited my interest in the troubled region, but underlined how little I know about its history. I aim to rectify that. The second I bought in 1988 when I was co-writing a daft play about the assassination of JFK called President Kennedy’s Big Night Out. This was in the dark days before the internet, and the quickest way to “research” his shooting was to buy a book that covered it. I only read the assassination chapter at the time, and filed the book away for what turned out to be over 20 years. 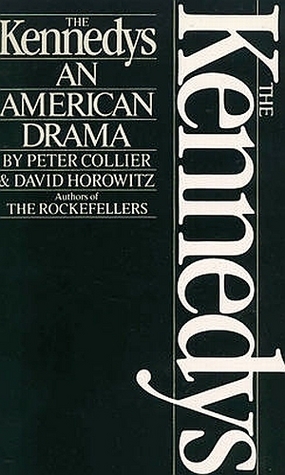 I plucked it from the bookshelf before Christmas after yet another documentary on TV about the Kennedys. Even though the family tree that’s helpfully supplied ends in 1984, at which point lot of Kennedys now dead were still alive, it’s their rise to prominence that I’m interested in and which is proving fascinating. It’s not just about trivia, but you’ll love this: in 1929 patriarch Joseph Kennedy made so many phonecalls to his lover Gloria Swanson that he had the highest personal phone bill in America for that year. The third book is the easiest read of the three, although still unwieldy as I have it as a pre-publication advance proof, with a plain orange cover. Over Christmas and New Year, this was the book, and I was getting through its detailed political history of Britain in the 1970s at a rate of knots not seen since I rattled through the complete works of David Peace two years ago. (A rare excursion into fiction, although his novels are so rooted in history, they almost count as non-fiction.) 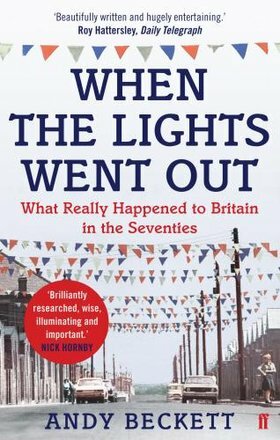 When The Lights Went Out I would recommend to anyone who’s interested in the way we live now, since so much of the pain we’re feeling in 21st century Britain has its origins in what happened between the election of Heath in 1970 and the election Thatcher in 1979. It deserves finishing. I owe it that. I owe Andy Beckett that, for all his thorough research, and all the dying 70s politicians he interviewed in the process. But Sir Martin Gilbert, a historian who has written more books than most of us will read in a lifetime, has barged Beckett off the top of the pile. I will return to Britain in the 70s, of course, but for much of the foreseeable I’ll be at the birth of a nation in Palestine. So, like some kind of time traveller limited to the 20th century, I’m currently in Britain in the 1970s circa the Social Contract, Palestine in the 1920s circa the Balfour Declaration, and Hyannis Port in the 1940s circa the death of “Young Joe” Kennedy in a disastrous American bombing raid called Operation Aphrodite. Each time I pick up a book, I have to reacclimatise to the era and the climate. What I observe about myself, with no forward planning about what I’m going to read next, is that I am clearly a 20th century man. I have spent the last 15 years educating myself. I was no good at history at school. I’m not sure it was as interesting at O-level in the 70s – my main memory was the Industrial Revolution: canals, looms, the Stockton-Darlington line – and I certainly struggled to engage with it. I failed O-level history. In fact I got a “U” grade, which isn’t a grade, as it stood for ungraded. So, in my thirties I returned to the subject and filled my shelves with history books. I even joined a history book club, which meant one new paperback a month. I read about the Reformation, and about the two World Wars, and about the Russian gulags, and the Vietnam war, and … actually, apart from the Reformation, you can start to spot a theme. I devoted myself to understanding the 20th century. I’m still at it. History is so much more fun when you plan your own curriculum. I think researching my biography of Billy Bragg in 1997 – using books, as I was pre-dial-up – really concentrated my mind on getting to grips with the century we were then still living through. Not all history books are fun to read. Some are dry. Some, like John Keegan and Eric Hobsbawn, are not. I’ll be honest, Israel is fairly dry – which is apt, I guess, as the very inhospitability of the Arab soil lies at the heart of the Zionists’ story, of the physical struggle and determination to lay down roots in a foreign land they felt was theirs, and the century of trouble that led to – but I will persevere. 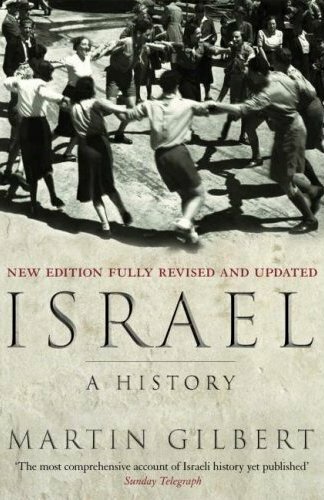 I notice that Simon Sebag-Montifiore has a new book out called Jerusalem, and he’s a very readable historian, but that doesn’t fit in with my New Year’s Resolution, which I am determined to stick to: only read books I already own. I will review all three books when I finish them. I can see in a secondary pile Robert Service’s biography of Lenin and a brilliant book about post-Communist Russia called The Oligarchs by David Hoffman, both of which I started and set aside when more pressing reads took over. I will return to those first. Because I already own them.